The week of action started with fortifying the camp against eviction, and as the camp was still happily pitched on Tuesday morning, we decided to put our energy into stopping Shell, as planned! Tuesday 5th midday, we noticed a lot of Gardaí lining the road near the entrance of a camp. Had they already heard we were planning on going out? Well, they had definitely brought the opportunity of stopping Shell right to our door. With barely enough time to say ‘Shell Out’, people headed out immediately on their own account to stand in solidarity with the local community and block the guarded convoy. There were a few different rounds of people peacefully holding the ground in front of the first truck, before each of them were dragged away. People then made it on to the top of the truck, accompanied to quite a lot of yelling as the driver started to pull away – so many people stood back in front of the convoy. Clearly the progress of 5 metres in half an hour wasn’t their plan, and the Gardaí picked off two people for arrest who were still standing in front of the convoy when there was no longer any protesters on top of trucks. Tuesday afternoon, a couple of hours later, several undeterred people visited one of the Shell’s acquired land plots of land – the route of the onshore pipeline, now a fragmented forest due to the clear-felling. Another blockade of the road followed nearby, with several people climbing on top of a truck. A Garda cherry-picker was called in, and then the cherry-picker was occupied too! 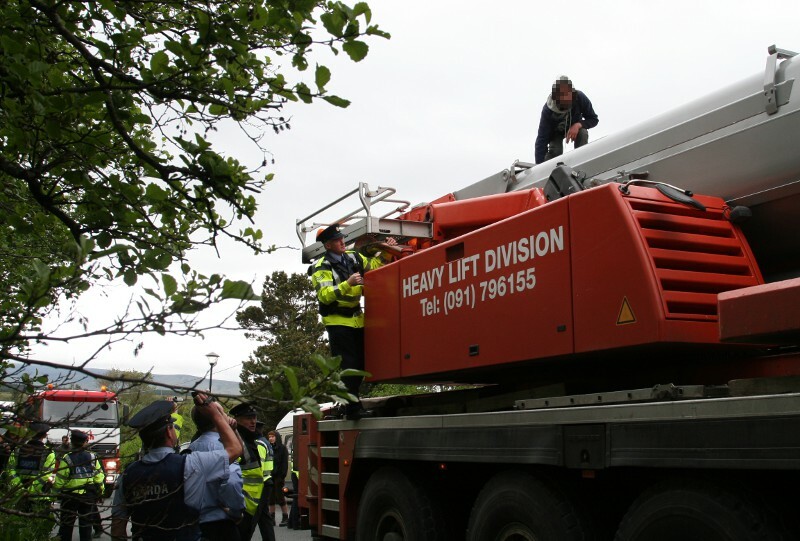 One campaigner who stayed on the machine was dragged down & arrested, then another campaigner was brought down from the Shell truck with the help of a cherry picker and arrested. A one-man critical mass slowed a convoy going the other way down to first gear – bicycle-speed, that is. Wednesday, which saw Mayo hit by the largest ever earthquake on Irish territory, also saw Shell attempt to bring in a lot of concrete trucks aided by even greater numbers of Gardaí than the previous day. There must have been at least 40 or 50 Gardaí in the area to attempt to force through Shell’s haulage. Despite the number of Gardaí present however a concrete lockon was successfully put in place on the the Shell haulage route and 2 people locked on. After a while though Shell began bringing the concrete trucks down a unapproved road much to the annoyance of local residents. A local farmer who was on his way to the bog, had the transport box taken off his tractor and had his tractor pushed off the road by Gardaí in order to make way for Shell cement trucks. A number of local residents and campaigners from Rossport Solidarity Camp were assaulted by Gardaí while significant disruption to the Shell haulage continued for the rest of the day. Thursday saw Glengad resident Eamon Murphy refuse to the reverse when he met a Shell convoy coming up the hill at Glengad. Despite Gardaí threatening to smash the window of his car, he stood this ground until after about 2 hours his car was towed away by local contractor TJ Carey. Eamon was not arrested however. Subsequently a campaigner climbed up on one of the Shell trucks. Four Gardaí quickly climbed up on the truck and after assaulting the campaigner proceeded to pull the campaigner down from the Shell truck without any safety gear and with total disregard to health and safety procedure. The campaigner was then detained and brought to Belmullet Garda Station, where again he was assaulted inside the Garda Station by being thrown against doors inside the station while wearing handcuffs. The Garda violence was led by Sgt Dermot Butler and Sgt Aidan Gill who have long been a major source of the violence and abuse that has been dished out to peaceful campaigners. Friday was a quiet day overall, with very little haulage going on presumably due to the torrential rain. …Tuesday 12th saw up to 20 members of Rossport Solidarity Camp out blocking Shell haulage trucks once again. Significant disruption to the morning’s haulage ensued from people both walking out in front of the trucks and with some people climbing up on the trucks. 2 people climbed up on one truck and the Gardaí cherry-picker was called out from Belmullet to remove the 2 people. Campaigners also visited Shell’s construction site of the pipeline route, holding up work until one campaigner was dragged out on to the road by security guards. 9 people are due to appear in Belmullet District court tommorow morning while Terence Conway is due to appear in Castlebar Circuit Court on Thursday 14th to appeal his 3 month jail sentence for taking part in two lockons.